Part of the Smart Marketing for Engineers™ ebook series from TREW Marketing. Need help launching a product? 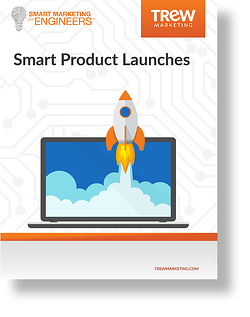 This ebook provides a framework for developing your product launch plan, discusses how to position your product in the marketplace, and includes practical tips for choosing, implementing, and measuring smart marketing activities and tools. It also includes case studies of three diverse, successful product launches. This ebook, written specifically for the business owner, product manager, and marketing leader, prepares you to launch a product targeted to technical audiences in the B2B space. Generate buzz, drive visits to your website, and set yourself up for increased leads and sales that drive sustained growth through a product launch. Finally! A guide written to help define the mix of marketing tools that will best help you meet the objective for your product launch. Explore some examples of clients we have worked with and how their diverse goals and mix of marketing activities effectively helped them achieve success. To access this free guide, please fill out the form on the right.